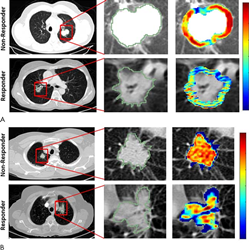 Using data from computed tomography (CT) images, researchers may be able to predict which lung cancer patients will respond to chemotherapy, according to a new study published March 20, 2019, in the journal Radiology: Artificial Intelligence. Our aim in this study was to determine whether an early prediction of response to chemotherapy is possible by using computer-extracted measurements of patterns both within and outside the lung nodule, along with the shape of the nodule, on baseline CT scans. Using data from computed tomography (CT) images, researchers may be able to predict which lung cancer patients will respond to chemotherapy, according to a new study published in the journal Radiology: Artificial Intelligence. Platinum-based chemotherapy is typically the first-line treatment of advanced-stage non–small cell lung cancer (NSCLC). However, only about one in four patients responds well to this treatment. Currently, there is no way to predict which patients will benefit most from chemotherapy. CT exams are routinely used for tumor staging and monitoring treatment response. Using a field of study called radiomics, researchers can extract quantitative, or measurable, data from CT images that can reveal disease characteristics not visible in the images alone. “Our aim in this study was to determine whether an early prediction of response to chemotherapy is possible by using computer-extracted measurements of patterns both within and outside the lung nodule, along with the shape of the nodule, on baseline CT scans,” said Mohammadhadi Khorrami, M.S., a Ph.D. candidate from the Department of Biomedical Engineering, Case Western Reserve University School of Engineering in Cleveland, Ohio, who, along with Monica Khunger, M.D., from the Department of Internal Medicine at Cleveland Clinic, led the study. The researchers set out to identify the role of radiomic texture features—both within and around the lung tumor—in predicting time to progression and overall survival, as well as response to chemotherapy in patients with NSCLC. They analyzed data from 125 patients who had been treated with pemetrexed-based platinum doublet chemotherapy at Cleveland Clinic. The patients were divided randomly into two sets with an equal number of responders and non-responders in the training set. The training set comprised 53 patients with NSCLC, and the validation set comprised 72 patients. A computer analyzed the CT images of lung cancer to identify unique patterns of heterogeneity both inside and outside the tumor. These patterns were then compared between CT scans of patients who did and did not respond to chemotherapy. These feature patterns were then used to train a machine learning classifier to identify the likelihood that a lung cancer patient would respond to chemotherapy. “When we looked at patterns inside the tumor, we got an accuracy of 0.68. But when we looked inside and outside, the accuracy went up to 0.77,” Khorrami said. The results showed that the radiomic features derived from within the tumor and the area around the tumor were able to distinguish patients who responded to chemotherapy from those who did not. In addition, the radiomic features predicted time to progression and overall survival. Although the researchers did not explicitly study the basis for the identified radiomic features around the tumor, they hypothesize that these patterns reflect increased fibrotic content in chemotherapy-compliant tumors. According to Khorrami, the radiomic data derived from CT images can also potentially help identify those patients who are at elevated risk for recurrence and who might benefit from more intensive observation and follow-up. “Combination of Peri- and Intratumoral Radiomic Features on Baseline CT Scans Predicts Response to Chemotherapy in Lung Adenocarcinoma.” Collaborating with Drs. Khorrami and Khunger were Alexia Zagouras, M.D., Pradnya Patil, M.D., Rajat Thawani, M.D., Kaustav Bera, M.D., Prabhakar Rajiah, M.D., Pingfu Fu, Ph.D., Vamsidhar Velcheti, M.D., and Anant Madabhushi, Ph.D.
For patient-friendly information on lung cancer, visit RadiologyInfo.org.